Retired Army Capt. Jefferson Keel is also Lt. Gov. of the Chickasaw Nation. He’s shown here during a recent visit to the Tomb of the Unknown Soldier at Arlington National Cemetery. If he were so inclined, retired Army Capt. Jefferson Keel could tell a lot of war stories, having served in Vietnam’s Central Highlands as an Airborne Ranger from 1966 to 1968. He was wounded during the Tet Offensive and returned to Vietnam again from 1970 to 1971, collecting several Bronze Star and Purple Heart medals in the process. But Keel doesn’t like to talk about his own experiences in Vietnam. Instead, he prefers to keep the focus on those who never returned — those who paid the ultimate price. 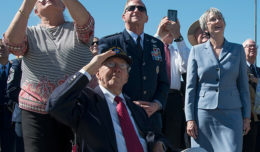 “We often talk about our brothers we left behind in Vietnam, particularly around the time of Memorial Day,” he said, referring to the frequent conversations on social media he has with his fellow brothers-in-arms. Keel said there are so many he served with who didn’t come home, that sometimes he loses track of their names. So when he visits the Vietnam Veterans Memorial Wall, he said he looks for the dates on the wall when he was in Vietnam and then goes down the rows of names listed there. When he comes to a name he forgot, that’s when he remembers. Many who did return home came back with post-traumatic stress disorder. Keel said he’s had to work through his own mild case of PTSD, and he suspects everyone who served there has it to a certain degree. Although Keel honors the memory of those who died in Vietnam, he tries not to focus on the war. Instead, he focuses on the positive things that happened during that time, like making a lot of friends. “Those bonds that we formed while we were there are ‘forever bonds’,” he recalled. Keel said he attends annual unit reunions when he can. His first tour in Vietnam was with the 1st Cavalry Division and his second was with the 101st Airborne Division. 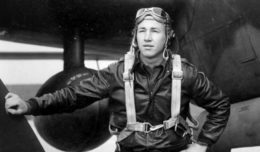 For the first half of his Army career he served as an enlisted Soldier. He left the service to attend college, then returned to the military and finished the second half of his 20-year career as an officer. When he attends reunions, Keel said he sees his fellow veterans as brothers. Keel himself is more than one-half Chickasaw. He lives in Ada, Okla., an area in the south-central part of the state that two-thirds of the 64,000 Chickasaw people call home. 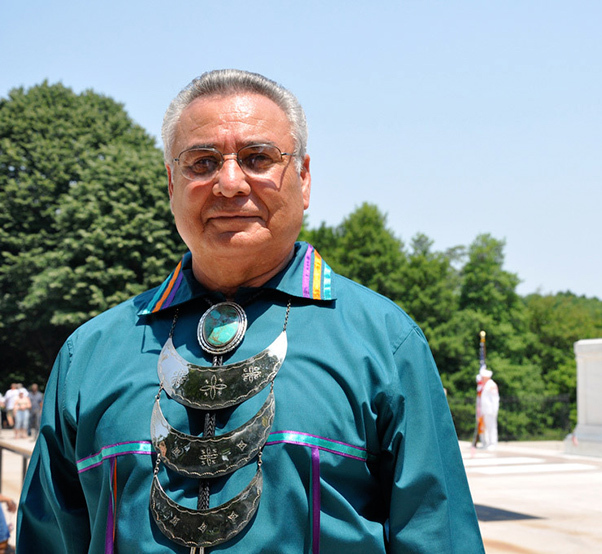 The reason that Keel gets to visit the wall so often is because his duties as lieutenant governor of the Chickasaw Nation take him to Washington, D.C., on a regular basis. The Chickasaw Nation once had chiefs and kings, he said, but then the people adopted a tribal constitution patterned after the U.S. government, with three branches of government and regular elections. As lieutenant governor, he represents the governor and the tribe to U.S. government agencies such as the Department of Health and Human Services, the Department of the Interior and the Bureau of Indian Affairs. 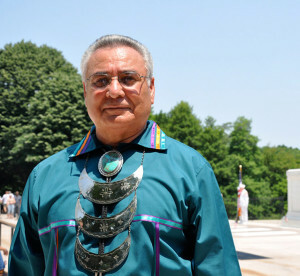 He’s also called on often to testify in hearings on Capitol Hill.In addition to serving as lieutenant governor of his tribe, Keel also co-chairs a 28-member advisory committee that oversees efforts to erect a memorial to Native American veterans at the National Museum of the American Indian by 2020. Keel said he also participates in Chickasaw cultural activities at home. While many Indian nations have pow-wows, the Chickasaw have what is referred to as “stomp dances,” he said. He invited Native as well as non-native people to join in at the stomp dances that occur on a regular basis at the nation’s new cultural center in Sulphur, Okla.
As for future plans, Keel said he wants to continue doing exactly what he’s doing now: serving the Native American communities. “I’m grateful they allowed me to do this,” he said, referring to the elected office he now holds.